I just finished making a car out of vegetables with Ben. It was a school project for the STEM academy that he attends. STEM for those who don't know is a charter school that focuses on Science, Technology, Engineering and Math. It is in its second year and all in all, seems to be better than it was its first year. Year one everyone was new to everything, so the communication was bad, the curriculum was confusing and the students were disoriented as to the new expectations. Year two has seen some improvements in the communication for sure. Ben's teacher from year 1 was an email fanatic. Some days we'd get 3 or 4 emails. I'm all for communication, but my time spent reading email is valuable too. Lets keep it to two, or better yet one. Ben seems to be doing better as well. We've been trying to work with him on remembering homework assignments BEFORE he leaves school. He's doing better than early in the year, so something must be clicking. 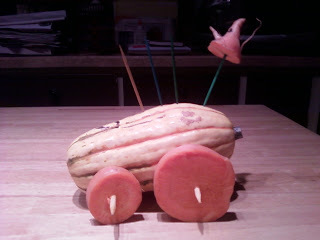 In fact, he even came down and asked me if I would help him with his vegetable car. It's not often that he remembers something's due, let alone asks me 2 days in advance to help. Now, I'm not sure how a car made out of vegetables fits into rocket scientology, but I trust they know what they're doing in STEM. It certainly required a bit of creativity if nothing else. I guess they're going to race them all down a track of some sort for sort of a veg-car derby. There are several differences between the school days of now vs. back when I was a kid. The biggest for my kids is that they don't have to wear uniforms. Because I went to private grade/high schools, I always had to wear a uniform. No worries about fashion or style there. You were always out of style in your parochial uniform. It did make getting dressed much simpler. I've heard that Einstein wore the same clothes every day. Maybe that's what they were trying to do...make lots of little Einsteins. I remember my mother every fall would have to go to the uniform store, a unique store that sold everything from school uniforms to nurse skirts to janitor uniforms. First she would assess the hand-me-down factor and see if Paul could wear Rob's pants from the year before and so on. Then she'd lay out the money for everyone to have two pair of pants and two shirts. Some years they would change the style or fabric of the uniform to my mother's chagrin. That meant that some of the hand me downs would not work because they were out of style. Nowadays, kids all need to have the aeropostle shirts or the skateboard shoes, etc., etc., all in the name of being cool and fitting in. It's funny how as a culture, we train them young that style and name brands matter (they don't) and that you are what you wear (you aren't). It's no wonder they grow up to be consumers of all things name brand. What do we expect? On top of that kids are going to school with expensive phones and expensive iPods, iPads and laptops that, back in the day, would have made my mom's head spin. I better stop now. I'm starting to sound like I'm almost 50.